An East Midlands fire service is spending £60m on a fleet of fully-equipped fire engines. 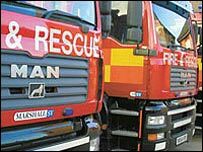 Lincolnshire Fire & Rescue is getting 35 new engines and 22 refurbished ones as part of a new public-private partnership agreement. Officials said the fire service equipment will now be owned and maintained by a private contractor under the 20-year agreement. The new engines will arrive between June and December 2007. AssetCo, based in Reading, will both provide and manage the new fleet. "The firm is responsible for ensuring the fleet of fire engines is available at all times and they will face a financial penalty if they fail to provide the proper equipment," the fire service's business relationship manager Dave Hopkins said. "We hope this will improve the standards of availability across the county and result in a better level of response across the county," he said. The refurbished engines will be kept for five years and then be replaced with new ones. North Lincoln fire station manager John Taylor said: "The modernisation is due as some of the service's fire engines now date from 1990. "For the first time every station will have the same equipment, so things will be much simpler at the scene of an incident." New rescue equipment includes lightweight cutting tools that are easier to set up and adjust, he said.